$45.00 In stock. Order in the next 7 hours, 58 minutes and it will go out today! Get the companion 3-DVD set to the Christopher T.'s book, BEYOND Look, Don't See. It's Christopher T.'s LIVE from the LIVING ROOM. This is a one-stop resource for kid show magic and inspiration! Ladies and Gentlemen, boy and girls… LIVE from the LIVING ROOM! It's SATURDAY AFTERNOON! Christopher T. Magician is consistently rated as one of the top children's entertainers in metropolitan New York. A graduate of New York University's Tisch School of the Arts and BMI's very exclusive musical theatre songwriting program, Christopher is in a level and class all his own. He's an experienced kids show specialist who takes his magic, comedy, and goofing around very seriously! Christopher T. Magician has wowed and transformed HUNDREDS of magicians around the world with his entertaining, hysterical, and educational YouTube series, CHRISTOPHER T. MAGICIAN PRESENTS! Each section provides a detailed commentary and examples of how to deliver a well-plotted show in real time. The end result is a group of 7 to 9-year-olds rolling on the floor with laughter. The Show does not feature a collection of "best of" clips, but a LIVE show presented from start-to-finish, so you'll see Christopher T. in action interacting with children and seeing his Magician Control techniques in action. 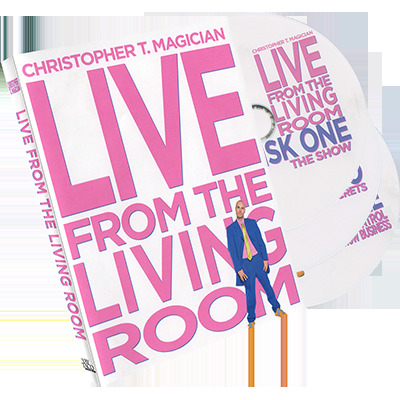 Every detail of the show is explained to a "T" in The Secrets portion of the DVD and in Bits of Show Business Christopher provides a fresh system for transforming your 'string-of-tricks' type magic show into an all-out satisfying piece of magical theatre. And finally, in Magician Control his discussion of kid control attempts to change the way magicians think about controlling children. His techniques will leave kids following your EVERY 'command' without ever giving a SINGLE order. Remember, you're getting over FIVE HOURS of never-before-seen footage and learning the methods of some of Christopher T. Magician's favorite routines developed over a decade of performing in living rooms in and around New York City.